Ann Khalid did not feel well but she insisted on dancing a brief scene from Tchaikovsky's Swan Lake with her classmates. The 12-year-old is determined to one day have a career dancing and teaching ballet, not an easy path in Iraq, a country for years torn by conflict. "My school and my church are the two things I love the most in Baghdad," the soft-spoken Khalid, in her black leotard and white ballet shoes, said with pride after the dance. 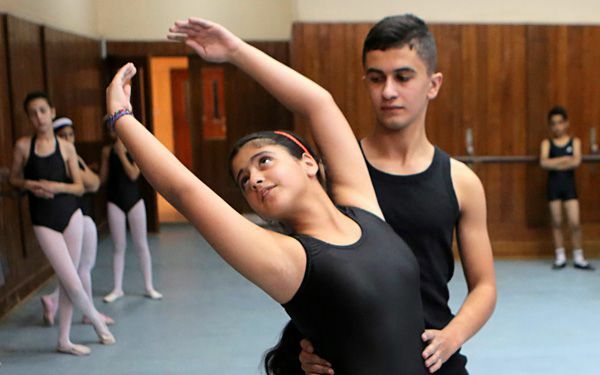 If she has a shot at her dream, it's because of the Baghdad School of Music and Ballet. The school has managed to survive decades of turmoil, a feat that speaks to the resilience of Baghdad's residents through war after war. The Iraqi capital's past as a Middle East center of culture is a distant memory but the school has carved out a tiny island of creativity amid the violence that is an inescapable part of daily life and the religious conservatism that now defines public life. "Where else in Iraq can you walk into a school and listen to a small boy playing Antonio Vivaldi on his violin?" boasts the school principal, Ahmed Salim Ghan, who is also a virtuoso player of the contrabass and the oud, an Arab instrument resembling the lute. Another rarity: It isn't segregated by gender like almost all Iraqi schools and male and female students take classes together from kindergarten to high school. "The second you walk through the gate, you find yourself in a different world, one of art and culture," Ghani said. Ghani proudly declares himself a "genuine" Baghdadi. He speaks nostalgically about Baghdad's golden age, the 1960s through to the 1980s. The school, founded in 1968, thrived during that era. Black-and-white footage of a 1977 school production of The Nutcracker shows a relatively high level of discipline, with the children dancing in professional-level costumes. In class photos from the era, the schoolgirls and female teachers wear miniskirts. The boys wear blazers and bow ties. Things rapidly worsened for Baghdad and the school with Iraq's 1990 invasion of Kuwait. U.N. sanctions upset the economy and forced hundreds of thousands to leave their homes in rural areas. Many moved to the city to find work, bringing with them the conservative traditions of their villages. The city plunged deeper into chaos after the 2003 U.S.-led invasion and the school was looted days after Saddam Hussein's ousting. Later it was partially burned. Amid the violence, religious extremism rose, nurturing the notion that ballet and to a lesser extent music is immoral and anti-Islamic. The school removed its large street sign to escape attention. Children hid their musical instruments when out in public or left them at school. The school's best Iraqi ballet and music teachers fled, seeking employment abroad. During the height of the violence, in the mid-2000s, the number of students plunged to an all-time low of 100-120, according to Ghani. Today, security in the city has improved, but bombings continue. "We hope it is just a phase that will eventually go away," said Salam Arab, whose 16-year-old son Maysara is considered one of the school's best male dancers. "It's a rare school in the Arab world, and it is very important that it continues to carry out its mission." The school now has around 500 students. But many parents now pull their daughters out of ballet when they are 12 or 13 because they object on religious grounds to the girls being lifted and embraced by boys their age while performing, according to Zeina Akram Fayzy, a 40-year-old ballet instructor. Leezan Salam, who graduated this year, said that when she started ballet at the school, there were around 30 girls with her. By the time she reached 10th grade, "we were only three." Khalid, the 12-year-old, says the moral questions surrounding dance don't dent her enthusiasm. "Everyone says it is haram (religiously prohibited) and disgraceful. But my parents are happy for me to dance," she said. She's the daughter of artistic parents her father is an actor and her mother a television director. Maysara said he doesn't tell people he dances. "Those in my neighborhood who have found out often mock me," he said. As they did drills together, his fellow dancer Moayed Nawar interjected, "I want to dance professionally." Then the 13-year-old added defiantly, "I am not going to stop, stay home and shut up about it." Critical thinking challenge: What makes the Baghdad School of Music and Ballet a different world? Would you grow a beard if you could? Its a different world because in this school of music there is no war. the students are safe. they don't have to worry about any harm because they know they are safe with the people that are at the school working with these students. It is a different world here because the children still dance when bombings and danger is out there, and lots of people think it is awful to dance and it goes against their religions. The children are determined to reach their goals still, and they work for it. They don't care about what others think. According to the text this girl knows how bad it is in her country of Iraq, there are real big problems there. Her dream is to become a professional dancer and a ballet teacher. All that is happening in Iraq that is very hard for her to pursue her dream. Nothing is stopping her she has full determination and nothing will stop that. I think it's sad people will be persecuted because they continue doing something they enjoy and are good at even though it goes against other people's beliefs. I am glad this school gives the children in Baghdad a chance to enjoy something with others who won't undermine them for it, and take their minds off all the war and violence going on. There are several things that make the Baghdad School of Music and Ballet "a different world." For example the school is one of the only schools where boys and girls are not separated. It is also one of the only places where there is very little violence. Lastly, it is a place where children can practice music and dance freely. The school is a different world because it' a place for the children to escape. The children can forget about war and just relax while doing something they love. The world that these kids know is different from the "world" that the school is referred to because they can actually enjoy themselves. The School of Music and Ballet is considered a "different world" because it differs so much from what is going on around them. No one else is trying to dance and play music during such rough times, and because they are different other people mock them. Even though what the school does is seen as immoral and anti-Islamic they continue to do what they love even if they are mocked for it. It is stuck in the middle of all this conflict, yet it still lives on. Even though the rest of the world is all screwed up, they can still dance and live their dreams when they are at the Baghdad School of Music and Ballet. I think what makes the school a "different world" is that it isn't segregated like most of the other Iraqi schools. Also, both males and females are able to take classes together from kindergarten to high school. It's a shame that war disrupted the lifestyle of the inhabitants of the place. Iraq must have been a beautiful place before the wars. It would be nice if we could restore Iraq to it's original peace time conditions.